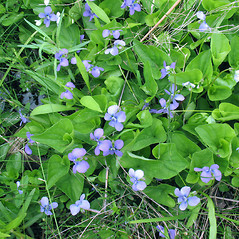 Blue marsh violet is a very common species of swamps, wet meadows and lawns. 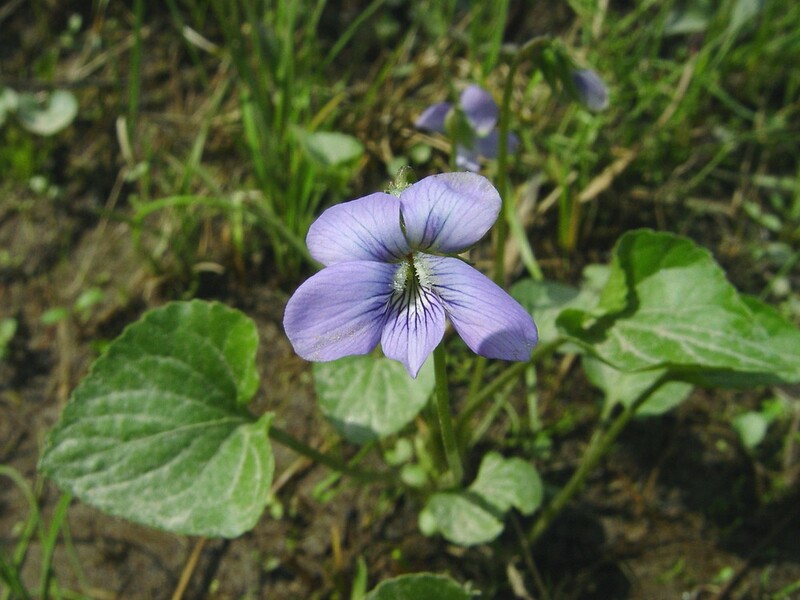 This violet is known to occasionally hybridize with other species. 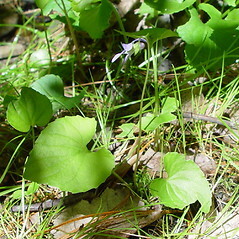 The Cherokee used a poultice of the leaves to treat headache. 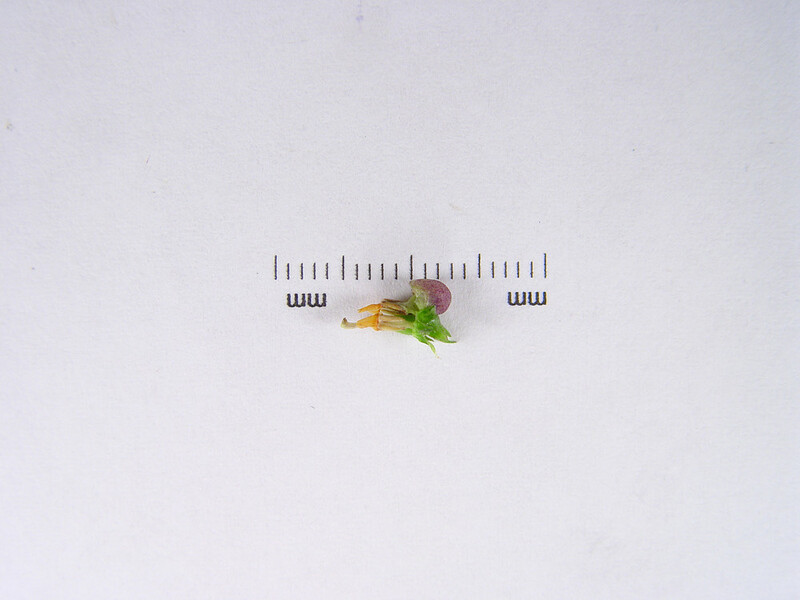 nectary spur elongate, 4-6 mm long, 2 or more times as long as wide, and all petals without hairs (vs. V. cucullata, with the nectary spur shorter, as long as 3.2 mm, less than 2 times as long as wide, and lateral petals with short, knob-tipped hairs on the inner surface). 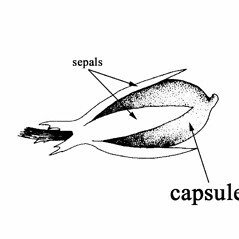 foliage hairy, sepals rounded to acute at the apex, and petal hairs tapering or rounded at apex (vs. V. cucullata, with the foliage without hairs, sepals acuminate at the apex, and petal hairs knob-shaped at the aepx). blue marsh violet. 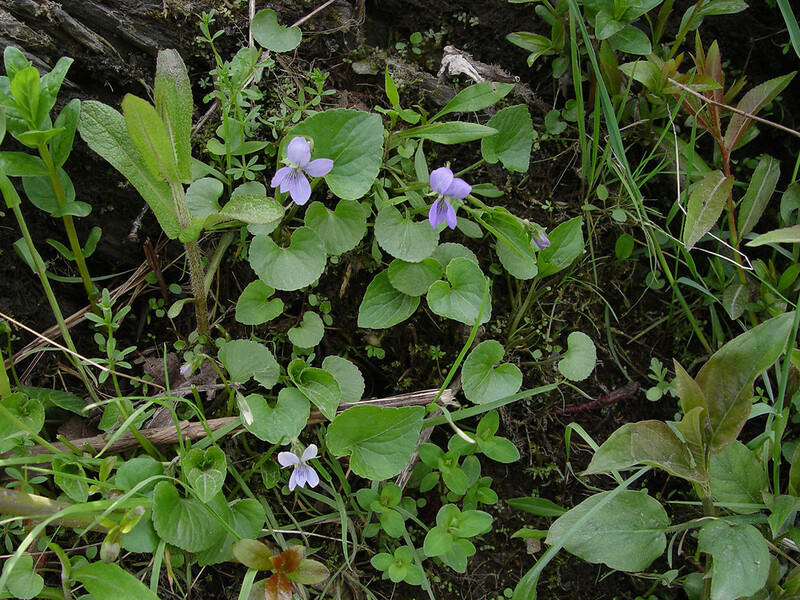 Viola cucullata Ait. var. 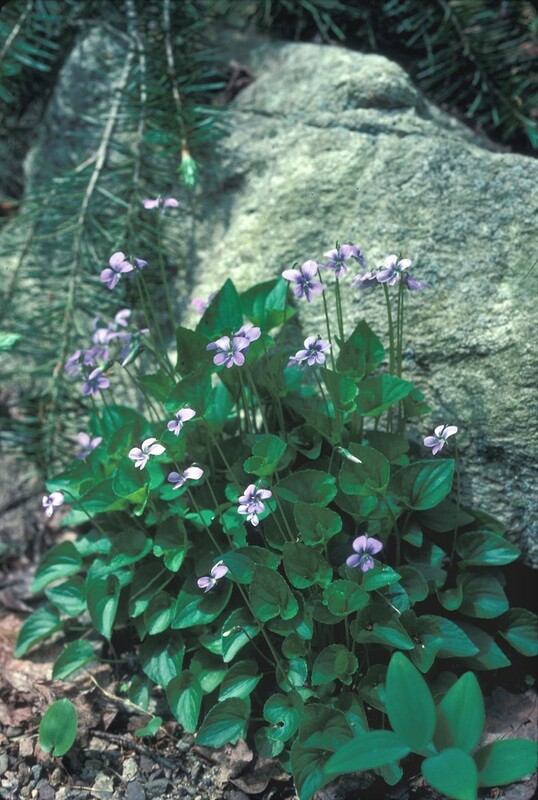 microtitis Brainerd; V. obliqua Hill • CT, MA, ME, NH, RI, VT; nearly throughout. 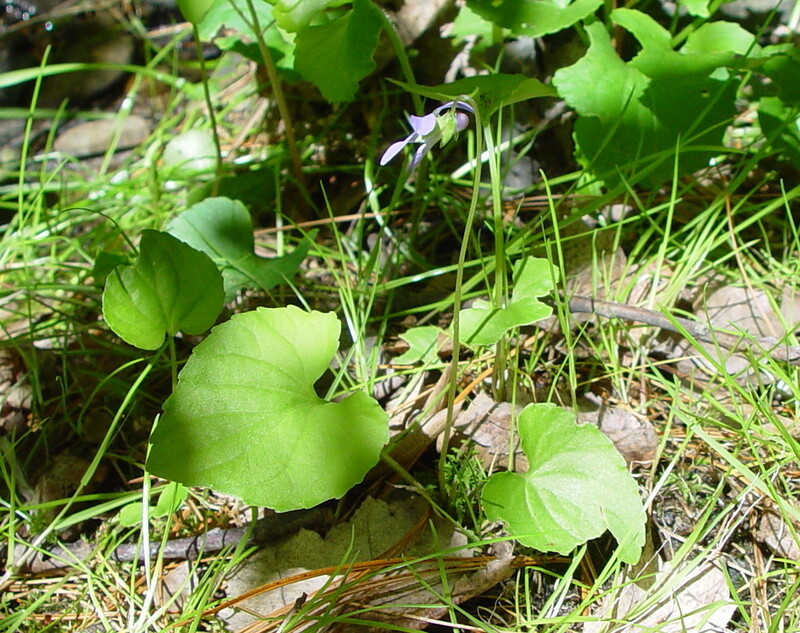 Swamps, hydric meadows, stream banks, seeps, shorelines, mesic to hydric lawns. 2×7. 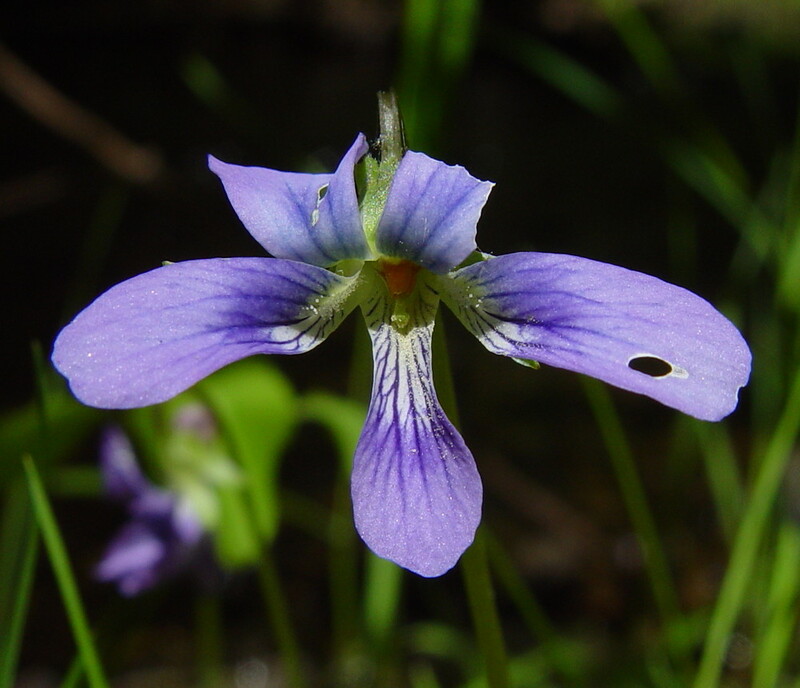 Viola affinis × Viola cucullata → Viola ×‌consocia House is a rare violet hybrid known from CT, VT. 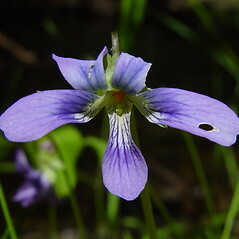 It has relatively glabrous herbage and differs from V. cucullata with more cylindrical or weakly clavate hairs of the lateral petals, the sparsely pubescent spurred petal, and capsules spotted with purple. 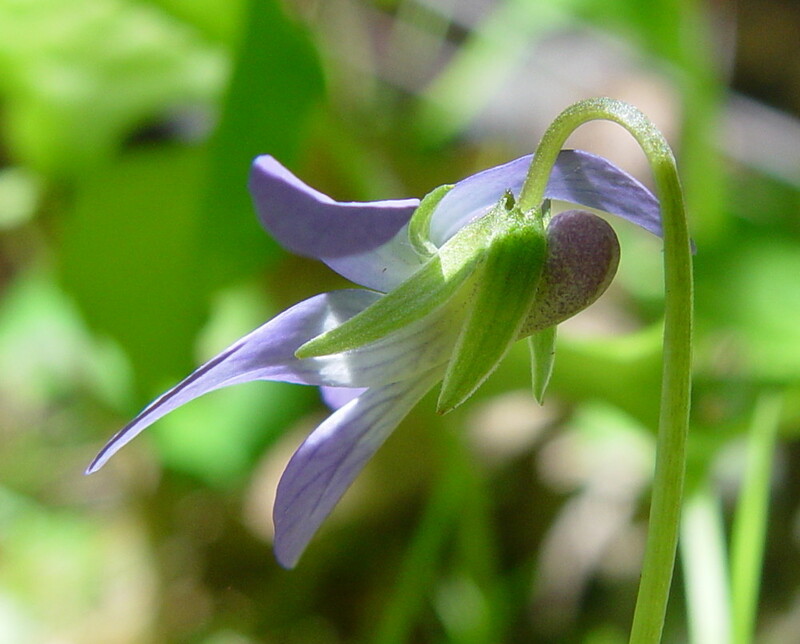 It differs from V. affinis in the more ascending cleistogamous peduncles, the corolla with a dark purple ring around the basal white area (similar to V. cucullata), and the elongate sepal auricles on cleistogamous fruits. 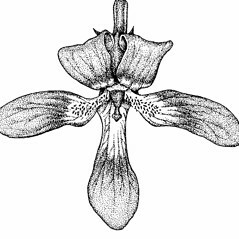 5×7. 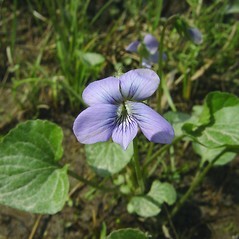 Viola brittoniana × Viola cucullata → Viola ×‌notabilis Bickn. 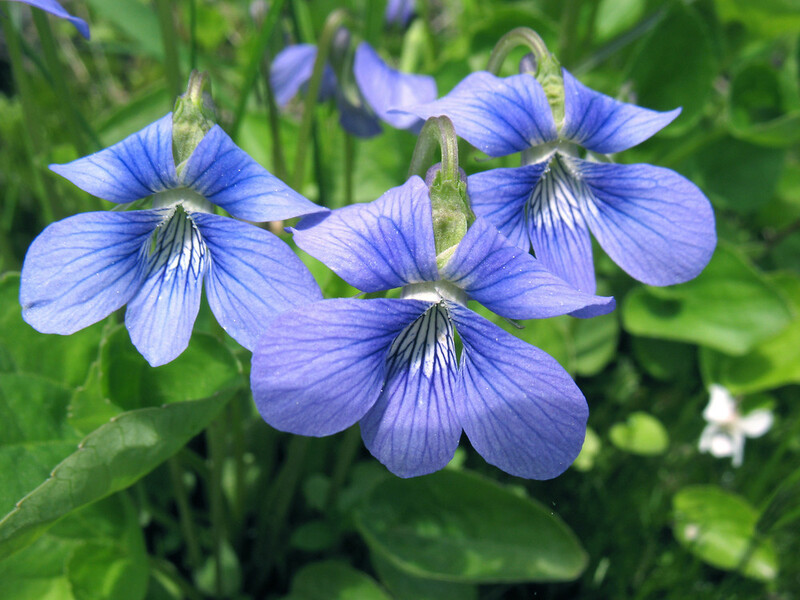 is a very rare violet hybrid known from CT, MA, ME (the ME population is an escape from cultivation, the others are naturally occurring hybrids in wild populations). 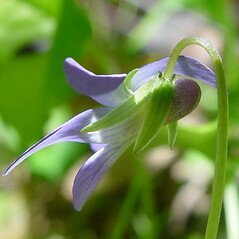 This hybrid is recognized by its ± glabrous herbage, robust size (characteristic of many V. cucullata hybrids), its variably lobed leaves with lobes broader and shorter than in V. brittoniana, and its longer, more cylindrical hairs on the lateral petals (not conspicuously knob-shaped as in V. cucullata). 7×12. 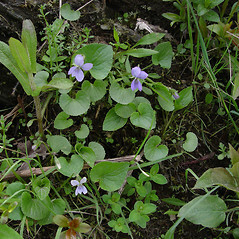 Viola cucullata × Viola nephrophylla → Viola ×‌insessa House is a very rare violet hybrid known from VT. 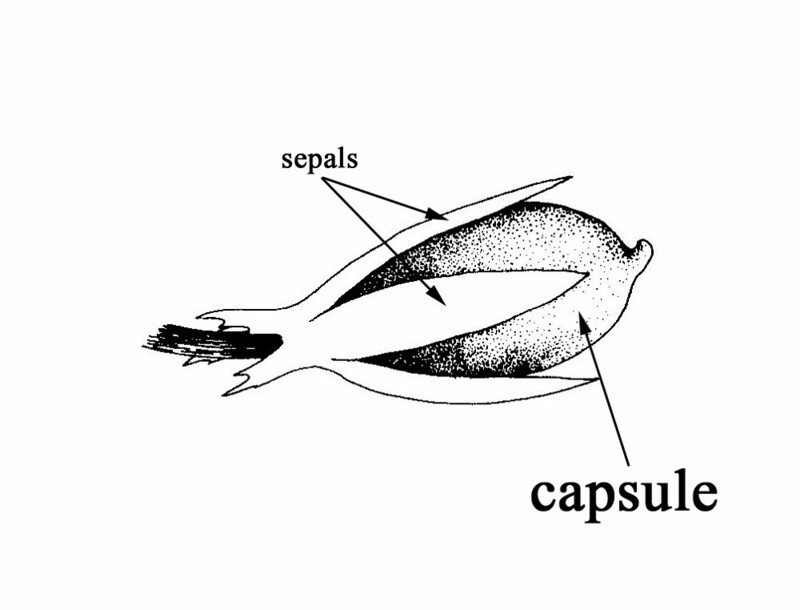 This ± glabrous plant is recognized by its intermediacy and, sometimes, combination of characters from the parental species, including cylindrical petal hairs that may be slightly expanded at the apex, a variably pubescent spurred petal (glabrous in V. cucullata, pubescent in V. nephrophylla), narrow-ovoid to ovoid capsules (mostly 2.2–2.5 times as long as wide in V. cucullata, mostly 1.2–1.5 times as long as wide in V. nephrophylla), and broad-lanceolate to narrow-ovate sepals (lanceolate in V. cucullata, ovate to ovate-oblong in V. nephrophylla). 7×27. 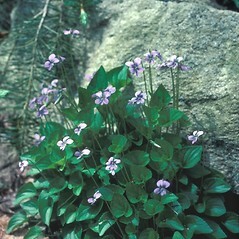 Viola cucullata × Viola sororia → Viola ×‌bissellii House is an uncommon violet hybrid known from CT, MA, ME, NH, VT. 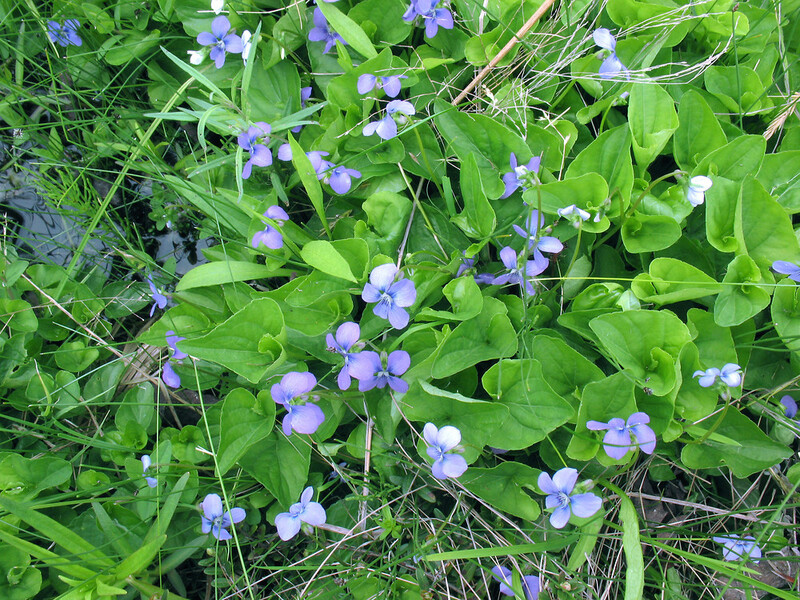 It is locally common in human-disturbed areas. 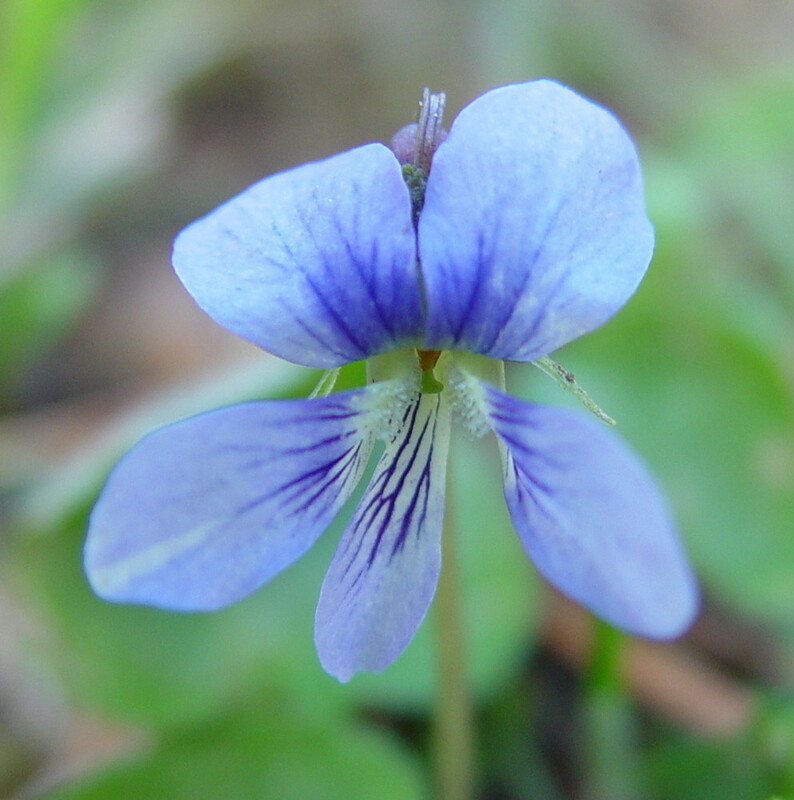 It is a sparsely pubescent, robust plant with sparsely ciliate sepals (at least on the auricles), slightly expanded petal hairs (i.e., intermediate between the two parents), variably prostrate to ascending cleistogamous peduncles, and a spurred petal that sometimes shows a few hairs. 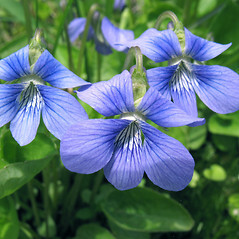 The corolla of this hybrid can be largely blue or is sometimes largely white with a blue ring around the white center. 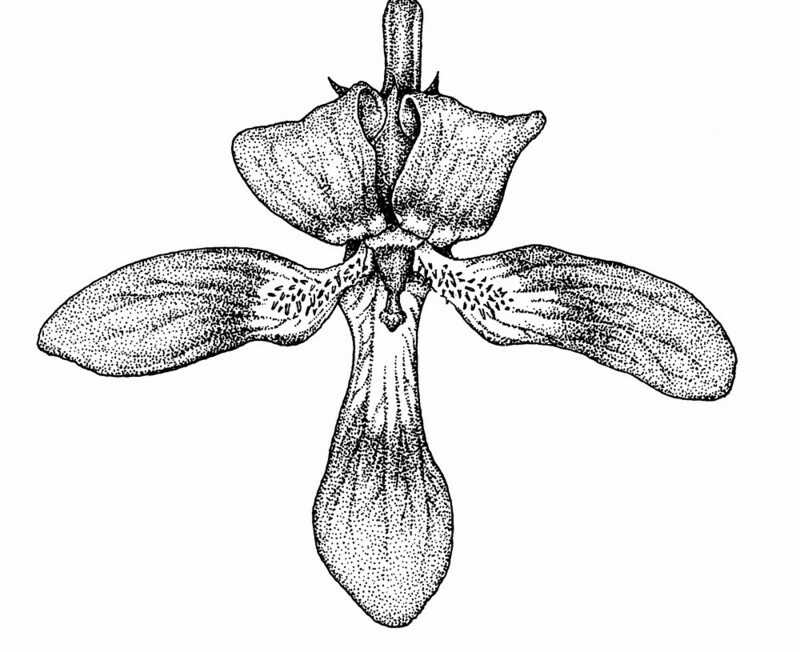 Descriptions of V. papilionacea (as well as many specimens determined as such) fit very well for this hybrid.